Brady Quillin Dorsey, 19, (left) and Matthew Brendan Fields, 21, were arrested and charged with burglary of a habitation. 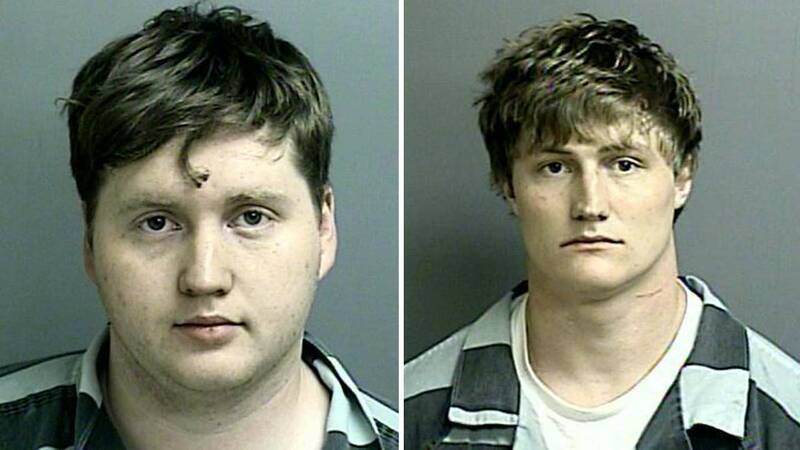 THE WOODLANDS, TX (KTRK) -- The Montgomery County Sheriff's Office says a couple of guys are facing charges after they reportedly used an old trick to find burglary targets. Just before midnight Tuesday, deputies got several calls for criminal mischief at home in the Village of Sterling Ridge, inside the Woodlands. Several residents reported someone had been throwing rocks through the windows of their homes. Deputies converged on the area, and quickly found two males hiding behind the last house where vandalism had been reported. In their vehicle, found nearby, deputies say they found a television and other electronics stolen from a nearby home. Authorities believe the pair would throw a rock through a window to determine if someone was home, and if the house was empty, they would break in and burglarize the residence. Brady Quillin Dorsey, 19, and Matthew Brendan Fields, 21, were arrested and charged with burglary of a habitation. The investigation is still on-going.